The study, published in Cell Reports, represents research from UT Southwestern’s precision medicine campaign in neuro-oncology. Glioblastoma is a fast-growing type of central nervous system tumor that forms from supportive tissue of the brain and spinal cord. It has cells that look very different from normal cells. Glioblastoma usually occurs in adults and affects the brain more often than the spinal cord. For the past decade, patients diagnosed with glioblastoma have been treated with the current standard of care regimen: surgery followed by chemotherapy and radiation. This regimen improves median survival by an average of four to six months, followed by recurrence of the tumor. There are currently no successful therapies available to treat glioblastoma patients when the tumor recurs. Five-year survival rates are around 5 percent. Faced with these prospects, the brain tumor research and clinical communities turned to genetic studies to guide possible treatment strategies. “Our work shows that the gene mutations which the pharmaceutical industry and clinicians have been focusing on are essential only for starting tumor growth. 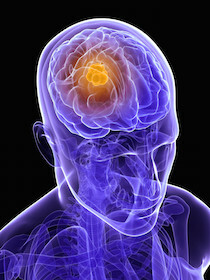 Once the tumor has advanced to the stage where patients seek treatment, these mutations are no longer required for continued tumor growth; they are in effect redundant,” said Dr. Bachoo, a member of the Simmons Cancer Center and O’Donnell Brain Institute, who holds the Miller Family Professorship in Neuro‐Oncology. Previously, proteins called receptor tyrosine kinase were considered the drivers of glioblastoma; however, drugs that inhibit these proteins have not been effective in treating this type of cancer. Dr. Kittler, a member of the Simmons Cancer Center and the Cecil H. and Ida Green Center for Reproductive Biology Sciences, is a Cancer Prevention and Research Institute of Texas (CPRIT) Scholar in Cancer Research and John L. Roach Scholar in Biomedical Research. The researchers caution that repurposing mithramycin, which is known to cause liver toxicity in some patients, with safer and more effective treatments for brain tumor patients may take years. This study was supported by National Institutes of Health, the Cancer Prevention and Research Institute of Texas, the Annette G. Strauss Center for Neuro-Oncology, the William Conley and Family Fund, the Miller Family Fund in Neuro-oncology, and the Beth Kahn Wings and Roots Foundation. Contributing authors include Dr. Bruce Mickey, Professor of Neurological Surgery, Otolaryngology – Head and Neck Surgery, and Radiation Oncology, who holds the William Kemp Clark Chair of Neurological Surgery; and Dr. Elizabeth Maher, Associate Professor of Internal Medicine, and Neurology and Neurotherapeutics, who holds the Theodore H. Strauss Professorship in Neuro‐Oncology. Both are members of the Simmons Cancer Center, the Peter O’Donnell Jr. Brain Institute, and the Annette G. Strauss Center for Neuro-Oncology. Other UT Southwestern researchers included co-lead author Rahul K. Kollipara, computational biologist; Vamsidara Vemireddy, research associate; Yuxiao Sun, research scientist; Nanda Regmi, research scientist; Dr. Kimmo J. Hatanpaa, Associate Professor of Pathology; Dr. Jack Raisanen, Professor of Pathology; Shyam Sirasanagandla, senior research associate; Tomoyuki Mashimo, research coordinator; Dr. Shan Wang, Instructor of Urology; and Caroline G. Humphries, senior research scientist. Additional researchers included co-lead author Dinesh K. Singh, a former UT Southwestern researcher now with the CSIR Indian Institute of Toxicology; researchers from the Albert Einstein Cancer Center and Cold Spring Harbor Laboratory; and former UT Southwestern researchers Xiao-Li Yang, Steve K. Cho, Suraj Nannepaga, and Sara Piccirillo. 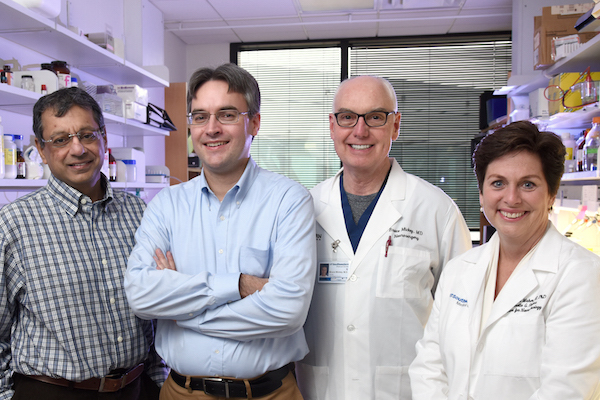 Simmons Cancer Center researchers (left to right) Dr. Robert Bachoo, Dr. Ralf Kittler, Dr. Bruce Mickey, and Dr. Elizabeth Maher have found a way to inhibit the growth of glioblastoma, a type of brain cancer with low survival rates, by targeting a protein that drives growth of brain tumors.